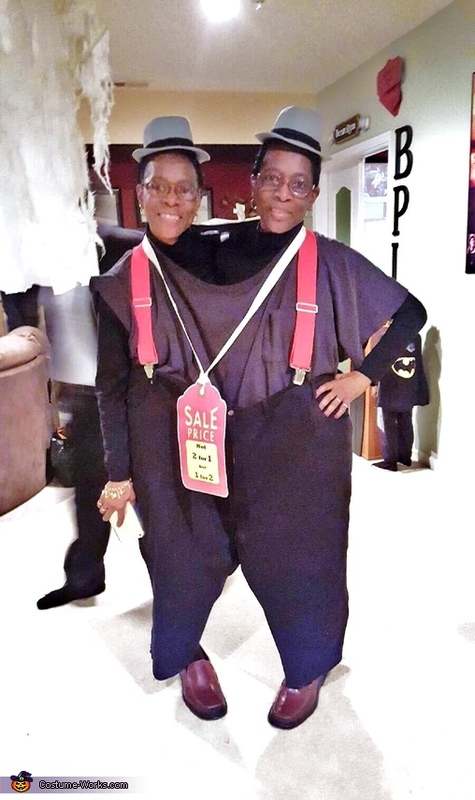 Twins, Joyce and Joan, are wear a size 68 pair of men's pants with a size 8X tee shirt, a pair of red suspenders, matching top hats and a pair of size 14 Bass Loafers. Joyce wearing the left shoe and Joan the right shoe. Around our necks is a "For Sale sign that reads: For Sale not 2 for 1 but 1 for 2. We brought a pair of size 68 men's pants and 8X tee shirt that both of us fit in together. A pair of shoes that were could put our own shoes in, matching top hats and a large pair of suspenders to hold up the pants. I made a replica of a sale sign and printed our price on it: For Sale Not 2 for 1, but 1 for 2. When posing we put our inside legs behind us,making us seem like one body two heads - one outfit for two.